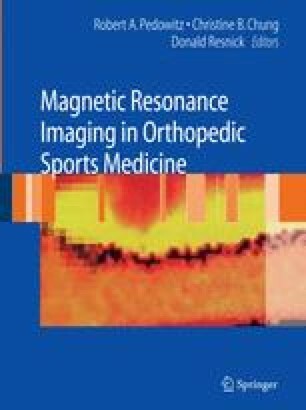 Today magnetic resonance imaging (MRI) of the knee is widely used after an acute traumatic event to assess for soft tissue injuries and occult fractures.1–4 Complex injuries of the knee are rarely due to complete disruption of a single ligament without either microscopic or macroscopic changes in one or more of the supporting structures. Bone marrow edema is also frequently encountered with these injuries. The pattern of ligamentous disruption and bone marrow edema depends on the type and direction of force causing the injury.5–7 This chapter discusses the various patterns of bone contusion and correlates each to a specific mechanism of injury. A thorough understanding of this relationship is important, as it is a valuable predictor of associated soft tissue injuries.